Five-Star beauty and relaxation centre. is the best present you can make yourself. It is also the nicest way a company can reward its employees. Here, at Riviera, we promote health and relaxation. The nice and refined atmosphere in our centre is ideal for all those who feel overwhelmed by stress and tiredness. Riviera Beauty & Spa is the ideal place to organise and host special events or meetings. Our qualified personnel will offer you personalised services, which will transform your ordinary meetings into special but efficient experiences. For the events you intend to organise. Riviera Spa offers you gift-cards you can give your employees as performance bonuses or as holiday bonuses, as well. Our diversity of promotional offers can also be used as rewards for the employees of your company. Riviera Spa offers you numerous ways of saying “Thank you” or “Happy Holidays”! Besides, for every corporate gift-card purchase over 3,000 lei you can print your company logo on the gift-card to create a personalized aspect. Behind a complete relaxation experience there is serious and professional personnel. Our specialised hairstylists offer personalised and relevant advice for every client. They are totally committed to their work; they train continuously and they promote the best hair products currently on the market. An impeccable manicure is the finishing detail of everybody’s aspect. Unlike classical manicure services, our clients will benefit from complex experiences, including optional spa manicure and intensive hydrating sessions. A very good relaxation method, but mainly a professional nail treatment which can bring our clients a feeling of comfort and trust. The services offered by our experts include the Thai massage, relaxing massage, reflexotherapy, anti-cellulite massage, facial massage, Swedish massage, couples massage, head massage, hand massage, prenatal massage, Balinese or Hawaiian massage. Sauna is one of the most beneficial therapy methods your body can enjoy. Detoxifications, protection against seasonal flu, weight loss, arthritis or joint pain relief or enhancement of your immune system are only a few of the advantages of the sauna. We can also add the profound relaxation every user experiences after the session. The body remodelling methods you can find at Riviera Spa are many and complex. Whether you want to lose a few kilograms, detoxify your body or rejuvenate your skin, our beauty experts will accompany you through every stage of the process. Vision Body Wireless is a unique service in Cluj-Napoca. With its help you can benefit from accelerated fitness programs which equal many hours of conventional sport. The extremely advanced technology and the intense care for beauty and rejuvenation are the ideal combination you can find in our beauty salons. Here, your skin can really go back in time. The pool at Riviera Spa, built using advanced pool filtration and circulation systems, is the ideal place where sport and relaxation become one. The water temperature is 29°C, which makes it ideal for swimming, and our qualified swimming instructors organize swimming lessons for both adults and children. Near the pool at Riviera Spa you can find a relaxing Jacuzzi, set in the perfect ambiance. Here, you can benefit from the advantages of the hydro massage; you can treat your muscular and joint pain, offering a little help to your entire metabolism. Every woman’s beauty is highlighted when her eyebrows are beautifully, but most importantly correctly, shaped. Personalised techniques for each type of face can transform a person, highlighting the eyes and harmonising the face. A professional eyebrow shaping focuses on the shape of the eyes and the face in order to get the best result. Although fashion trends impose a certain shape or colour, here at Riviera Beauty & Spa we encourage beauty through the best style for every person. At Riviera Beauty & Spa a skin without any unwanted hair is a beautiful skin. We use MANTIS technology, which transformed permanent hair removal by offering its clients, irrespective of age, a progressive hair removal process. With the help of the latest generation HR 808 Diode Laser, the hair removal happens in a painless way, when compared with classical or IPL hair removal processes. This type of hair removal is very efficient because it causes the hair follicle to overheat and permanently prevents it from growing back. In other words, the hair stops growing back due to the deterioration of the germinating cells. HR 808 Diode Laser can be used on face and body and causes no damage to the epidermis or to the skin tissue surrounding the hair follicle. The hair removal treatments can be carried out on all phototypes at any time of the year, with no contraindications. Find out more about HR 808 Diode Laser here. aici. Waxing is one of the oldest methods of removing unwanted hair. This fast and efficient method is used by millions of women throughout the world. Also, this is one of the services we offer in our salon. There are many advantages in choosing salon waxing instead of waxing at home, the most important being the client’s comfort, both physical and psychological. The greatest advantage of waxing is the long periods of time between sessions (between 6 and 6 weeks). In addition, the hair grows back thinner, lighter, and, in time it can completely disappear (in certain areas, at least). LEO is the secret behind some stars’ beauty, such as Madonna, Jennifer Aniston, Angelina Jolie, Brad Pitt, Sharon Stone, Tina Turner, Claudia Schiffer, etc. The “Daily Mirror” named this facial treatment “Madonna’s Secret to Youthful Skin”. Facial treatment performed with OXYJET LEO help transport Collagen, Hyaluronic acid and vitamins into the deep layers of the skin (the epidermis), through a special device (without needles), where cell division and skin regeneration take place. Thus, cell regeneration is stimulated and the result is soft, smooth and firm skin, without wrinkles and tight face contours. OXYJET LEO is a modern device used in facial and body treatments with amazing, non-invasive, results. Beauty-Tox facial treatments are a combination between Hyaluronic acid and Argireline (a peptide which relaxes facial muscles) which is pressurized into the skin with the help of the oxygen, and the result is a fresh, youthful skin. Choose now one of the OXYJET-LEO facial treatments available in our centre! With the help of the latest technology we offer you facial treatments combining the oxygen – the elixir of life – and highly effective cosmetic formulations. Facial treatments using the painless pulsed oxygen pressure injection with the patented OXYJET – LEO and highly effective cosmetic formulations have exceptional results, after the first session! Kryo is a product first used in medicine. Once you apply it, it lifts the contours of the face, regenerates and refreshes the skin. Practically, it is a cool tingly fresh cocktail which reduces expression lines and wrinkles, stimulates cellular collagen; it reduces the inflammations and dark circles around the eyes. At the same time, it can fill up the lips and reduce the lines surrounding the mouth – easy – having an exceptional effect. Kryo is simply a fountain of freshness. • To tighten face contours. • Excellent results in anti-aging and facial lifting therapies. Dr. Kleanthous is a global company offering innovative solutions in regenerative cosmetics. Inspired by the scientific insights, dr. KLEANTHOUS has come up with a concept which is a technological breakthrough used globally. This technological accomplishment materialized in the first ultrasound unit for cosmetics with a medical glass head (hygienic and easy gliding). In addition, the unit also comprises high-performance LED technology that generates light frequencies specifically matched to the cosmetic application. Full spectrum light and the modularly programmed ultrasound frequencies are key elements in the rejuvenation and impeccable skin aspect. Thus, these can be combined during treatment in 22 individual application programs. Many times, when we notice that time has passed over us, it is not the age the mood changing factor, nor does it influence our self-esteem and contentment. What really affects us is the aspect of our skin. A fresh youthful look is every woman’s dream that sees deep wrinkles and loose skin. A tight, impeccable skin is what every woman wants to get back, anytime. Skin Tone Kleanthous products are recommended to both women and men, independently of age and skin type. These products have a unique concept that works at the basis of skin rejuvenation: the cells. As a result, the skin becomes visibly younger and more vital, after one use only. Make-up is an art with an extremely important role in every woman’s life. Today, make-up is no longer a vulgar way of making oneself look beautiful but it has transformed in the habit of highlighting the most beautiful aspects of a person and obscuring the less favourable ones. Obviously, this result is achieved only when it is applied correctly. Day, evening, special occasions or the most natural looking make-up need advanced knowledge of morphology, colour mixing and the artist’s talent of creating perfect effects, all these combined with the client’s wishes. At Riviera Beauty & Spa we offer all types of make-up, we continuously improve our techniques and we use top of the range products, which do not harm the sin, but make it look as natural as possible. It is important to take care of our hair. The hair defines a person’s image and functions as a type of label for each one of us. Healthy hair is beautiful hair. Hairstyle trends come and go, but healthy hair is always trendy. No matter the changes you want to make, Riviera Beauty & Spa guarantees that you will benefit from hairdressing services with a positive impact on the health of your hair. Our stylists use only the best quality products, professional products, created with beautiful, shiny, strong hair in mind. Wella has been on the professional hair products market since 1880 and offers its clients products destined to hair care, dying and impeccable hairdressing. Wella is a German company with a global impact which has brought numerous innovations to hairstyling and organises annual competitions and events. The 130 years of experience is reflected by the products quality and the beauty of the result. Here at Riviera Beauty & Spa, we use System Professional Repair products, a line specially created for damaged hair. These products feed each hair, protect it and facilitate hairdressing. Wella colour palettes used in our salon are varied and belong to each category found on the market. L’Oreal has chosen to develop powerful research, because when talking about beauty, science is essential for innovation. For L’Oreal, innovation has always been fed by a constant dialogue between science and marketing. It is based on scientific knowledge more and more exact on hair and skin, but it is also based on carefully listening to its consumers from all over the world and on observing their beauty related behaviour. Here, at Riviera Spa, we offer a whole dying, hairdressing and hair treatment offered by L’Oreal to satisfy our clients’ demands. Nashi Argan, an Italian brand promoting quality and natural looking hair, offers its clients elegant and efficient ranges of hair products. All Nashi products are created with the help of Argan oil. This company provides solutions and unique treatments for all hair types. Anti-hair fall treatments and hair regenerating treatments are extremely efficient and are organised in full treatment kits, for all stages of hair dressing. The importance of hands, feet and beautiful nails is often underestimated. These define each person, just as hydrated skin, hair and a beautiful smile do. Beautiful, taken care of and adapted to our working environment nails are proof of our responsibility concerning the physical appearance. At Riviera Beauty & Spa you can benefit from careful hand and feet treatment in a relaxing environment, any time you need. Our manicure salon provides experienced specialists and professional products; this combination leads to impressive results. Hand care means more than simple manicure. Hands need constant hydrating, exfoliating and relaxing. Unless one applies hand care treatments, hands can prematurely age, their aspect is more and more ordinary and our self-esteem decreases with every passing year. Because of all these, we invite you to enjoy our relaxing sessions. Our hand care system includes treatments for hands, nails and cuticles, as well as aromatherapy sessions. Out feet suffer from all the external factors they are exposed every day. Feet care is not necessary only as a relaxing activity, but also for preventing affections which can cause serious problems with the passing of time. Spa pedicure is a cosmetic procedure which combines relaxation and intensive care. It includes feet massage sessions, professional cleaning, exfoliating, calming and intense hydrating products. Building nails with gel is an innovative procedure which helps us have an impeccable manicure for weeks on end, choosing colours and models that represent us. This procedure helps correcting the aspect of the natural nail and making it more beautiful. At the same time, it relieves us form the stress of daily or weekly nail care. Gel nails resemble perfectly natural nails, they have any length one wants and they do not harm the health. The gel used in building the artificial nail contains monomer liquid, polymer powder and oligomer, all these allow nails the flexibility of natural nails. Semi permanent nail polish has become very popular dye to its natural looking aspect. Semi permanent nail polish manicure is more accessible, it does not necessitate the application of the gel and it has got increased resistance when compared to regular nail polish. Our specialists use ultraviolet lamps, and this type of manicure can be obtained only in beauty salons. There are also infinite possibilities of creating models, textures and combinations of nail designs. WE BRING TRAINING TO A NEW LEVEL! Vision body is the solution for efficient training and fast results. Muscular electro-stimulation, a technology also known as EMS, is not a total unknown to the Romanians. It was first used in our country a few years ago and has since registered a fast progress, helping thousands of people in the weight losing process, among other situations. The EMS technology surprises its fans, offering the possibility of an efficient training session, the equivalent of 4 hours of conventional fitness classes. In addition, the people training using Vision Body at Riviera beauty and Spa will wear wireless costumes which won’t limit their movements and the type of training. The Vision Body Wireless System works using simple, intuitive, and easy to understand functions. During training you can set different frequencies, which stimulate different muscle groups, and stages of intensity, for each type of training. Vision Body begins the change! It is very easy, without a wet costume, without wires or sockets. This way you can save precious time. The anti-cellulite massage: The purposes of this type of massage are that of remodelling the aspect of the adipose tissue and removing the cellulite as much as possible. The masseur concentrates mainly on the area where cellulite is most prevalent (legs, thighs, arms or abdomen), either using only his/her hands or using a special instrument, in order to apply more pressure. This is done in repeated sessions, so that the “orange peel” skin is gradually reduced. Of all the natural remedies against cellulite, the massage holds an important place and must be taken into consideration when trying to solve this unpleasant condition. The Thai massage can offer you a lot more than you expect from a massage session. This art, combining stretching techniques (muscle stretching), pressure techniques and traditional yoga methods, can help you feel better, both emotionally and physically. The main purpose is relaxation, relieving aching muscles and cure tensioned areas of the body. Spa have a large knowledge to offer the clients. A few of the problems solved by the Thai massage include backaches, sciatic nerve pains, muscular cramps, digestive problems, pains in the shoulders, knees, elbows or neck, as well as insomnia, stress and concentration problems. Our salon offers you an alternative to aggressive medicine treatments, which only provide temporary relief and load your organism uselessly. Here, at Riviera Beauty & Spa you can enjoy the relaxation of the future. The Spa Capsule helps you relax, lose weight, detoxify and remove cellulite tissue, all at the same time. We have brought in our spa this multi-functional equipment, with effects on your body and mind, to offer you unique experiences. The Spa-Capsule is a translucent capsule, which functions as a dry and wet sauna, ozone therapy, chronotherapy, melotherapy, aromatherapy, Vichy showers, hydro massage and negative air ionization therapy equipment. The thermal baths offered by the spa capsule, the shower steam and jets, the radiant heat, the vibromassage and the comfortable bed, where you can sink into a complete relaxation sensation, are only a few of the effects of this technology. Have ever wanted to be on a tropical beach, listen to the sounds of the nature and be washed by the warm rains of the Equator or feel the ocean breeze? Once you enter the Spa Capsule, every relaxing dream can become reality. All you need to do is close your eyes and enjoy every single moment. The Spa Capsule, when combined with professional body wraps products, can be used both for body remodelling and relaxation purposes. With the help of Exilis Elite we can comfortably remodel human body and we can tighten loose skin, in the same session, for plenty types of treatments. Thus, the device covers a wide area of action and can be used for the following treatments: facial rejuvenation, wrinkles, eye circles, acne scars, body remodelling, loose skin, stretch marks and reducing fat deposits. Exilis Elite is the best system of medical aesthetics available on the market, which uses a combination of monopolar radio frequency energy, ultrasound to stimulate fat lipolysis and collagen remodelling, alongside skin cooking, helping to contour the body and face in a comfortable and efficient treatment. This reduces wrinkles due to the collagen remodelling and tightens the skin having extra anti-aging effects. In addition, Exilis Elite offers the possibility of remodelling the body in a very effective way, for all the aesthetic applications wanted by the clients. Because it uses a new and revolutionary platform in order to reduce the volume and model different body parts, Exilis Elite has visible results after one treatment. Exilis Elite uses methods clinically proven in independent laboratories, it has been approved by the FDA and it is used worldwide. The body remodelling device used in our salon is the result of many years of research in the field of medical cosmetics. Mantis, a renowned Italian company, has created impressive technologies and draws the attention to many scientific discoveries. The Mantis MR-991 uses the D.E.S. technology, which combines the use of two innovative technologies: MRM endomassage (mechanical manipulation with motorized rollers, which act simultaneously with a deep pulsating action), and CMPS (pulsed magnetic fields with stochastic resonance). The main objective of this device is removing body imperfections and inflammatory illnesses. Another priority is detoxifying and draining toxic substances in way as non-invasive as possible. The device imitates manual massage, but it reaches a deeper level of the skin tissue and classical massage. Endomassage is a technique which permits the suction of the skin with a rolling and unrolling action of the skin folds. This can be performed with different frequencies and power levels so it reactivates the microcirculation and reopens the lymphatic channels, as well as stimulate collagen and elastin production. People who want to remodel their body using Mantis MR-991 have the possibility of creating a specialised programme with the help of our beauty experts. Treatments can be performed both at face and body level, in order to rejuvenate the skin through intense oxygenation. Presotherapy is a set of techniques through which lymphatic drainage becomes more efficient. Toxins are eliminated from the body during presotherapy sessions, thus the detoxification process is successfully accomplished. The presotherapy equipment used at Riviera Beauty & Spa acts on the tissue, revitalising and oxygenating the skin. Legs, hands, abdomen and thighs can be remodelled at the same time. At the same time with the elimination of the toxins from the lymphatic system, the immune system is strongly stimulated. Thus, a person undergoing detoxification treatments will observe an increase in energy level, resistance against different illnesses, shiny, tonic, fresh skin and the list goes on. Presotherapy sessions are recommended by doctors as it helps to improve both the physical and psychological health. 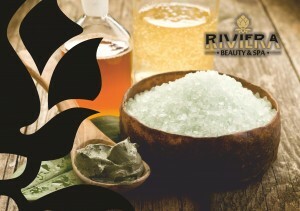 At Riviera Beauty &Spa we offer you everything you need to feel good. Relaxation is the physical and mental state we all crave, no matter the season. Because your relaxation is our priority, we have built and created an environment where you can harmonise your senses and forget about the rest of the world. The pool at Riviera Beauty &Spa awaits you to enjoy the water and the hydro massage every day of the week, regardless of the weather. When tiredness overwhelms you, the stress level is extremely high and your body needs to move and craves a massage, come to the pool! You will instantly feel revigorated! The interior pool is 19 m long, the water temperature is 28-29 ° Celsius and it is built using advanced pool filtration and circulation systems. As a result, you can choose to relax beside the pool at any time of the day. In summer you can also enjoy yourself on the tanning beds on the terrace. If you like swimming and because this is one of the healthiest physical activities there are, you wellbeing will be complete. If you can’t swim, our swimming instructors will be there for you. We organise swimming lessons for both adults and children. No matter the reason you want to come to the pool, we are waiting for you (but you have to book a place in advance) and we guarantee you will have a quality unforgettable experience! The Jacuzzi at Riviera Beauty & Spa is an important detail. This hydro massage tub is created to indulge your whole body. A 15-20 minute session is enough to feel your body massaged from top to bottom. The Jacuzzi has got long term beneficial effects on the body. It helps you to reduce the stress level, relax your muscles, tonify and hydrate your skin. Muscular cramps can be forgotten and the circulation is improved after short, regular periods of time in the Jacuzzi. Our recommendation is to try combining the pool, the Jacuzzi and the sauna for a complete relaxation experience. Are you in pain? Do you feel tired all the time? Do have difficulties breathing? Do you suffer from stress? Then the sauna is the ideal place for you. Of course, the sauna is also an excellent method of relaxation you can enjoy any time you want. Once you have entered our sauna, built with a wall of Himalaya salt, you fall into an atmosphere of complete relaxation and you breathe the air full of the beneficial properties of the wall of salt. The sauna helps fight against respiratory problems, allergies, tiredness, stress, circulatory and heart problems, as well as problems of the digestive system. At Riviera Beauty & Spa you can enjoy the pleasure of an intimate, chic sauna. In the lovely designs of it you can spend up to 20 minutes in order to offer your body and mind the relaxation you need.